Japanese carmaker Toyota has confirmed it will start making a hybrid model of its Auris hatchback in the UK from the middle of 2010. The car will be produced at Toyota's Burnaston plant in Derbyshire, using engines made in Deeside, Flintshire, the company said. Hybrid versions of other Toyota models are made in the US and Japan but none are manufactured in the UK. Toyota has targeted the hybrid market, as interest in greener cars has grown. Alyn and Deeside MP Mark Tami said it would be the first time Toyota had produced the hybrid engine outside Japan or the US. "Hybrid technology has enormous potential and I am confident this will secure the long-term future for many skilled workers at the Deeside plant," he said. Reports had suggested that Toyota would start making the new model around 2012. "The decision to build the hybrid Auris at Toyota UK represents the first materialisation of Toyota's plan to further its business operations in Europe and distinguish itself in that market through the strengths of its hybrid technology," the firm said in a statement. 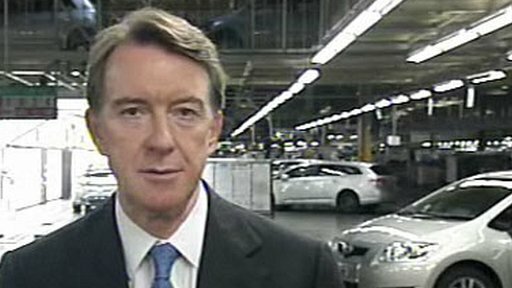 Business Secretary Lord Mandelson said it was "great news for jobs, not just here [at the Burnaston factory], but for the supply chain that supports manufacturing here". Welsh Deputy First Minister Ieuan Wyn Jones said the hybrid engine would be a "huge boost" to manufacturing in Wales. "It represents an investment in the future of automotive technology and in the future of one of the most important manufacturing centres in north Wales," he said. "Deeside will now be at the cutting edge of the car industry. "Hybrid cars are powered by both by petrol and electricity." Earlier this month, figures showed that Toyota's Prius had become the first hybrid car to outsell all other vehicles in Japan.